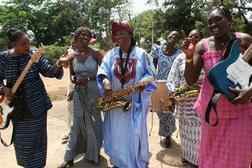 Les Amazones de Guinée are an all-female band from Guinea, founded in 1961. All members of the group were officers of the Guinean army, or 'Gendarmerie', The group continues to select members of its at times 15-20 strong lineup exclusively from the army. Founder members were Sona Diabaté, M'Mah Sylla, Condette Kouyate, Mama Niepo, Fatou Soumah, Nyépou Haba, and Kade Diallo. Other founder members need to be established. On 25th February 1983, Kade Diallo, the unique percussionist for Les Amazones was involved in a fatal road accident outside Conakry. It was only the day after the Amazones had returned from a well received tour of France. After this the group did not produce another record until Wamató in 2008, only the second record in their entire existence.